On the campaign trail, Comstock has heralded her role as chief investigative counsel for the House Committee on Government Reform during former President Bill Clinton's second term in office. Comstock was a thorough investigator and headed a number of high-profile investigations into Clinton White House affairs. While some turned up malfeasance, others didn't and Clinton loyalists have labels Comstock a serial and professional Clinton-hater. "Barbara Comstock's running for Congress, hell-bent on smearing Hillary Clinton," said a narrator in the House Majority PAC ad. The ad goes on to say that Comstock is "almost unhinged in her passion to bring down the Clintons," citing a book by David Brock, a Clinton defender. "Regardless of Clinton's political future, Virginians deserve a representative who will focus on them, not a long-standing political vendetta," Matt Thornton, communications director for the PAC, said in a statement. In a statement to CNN, a spokeswoman for Comstock called the ad a distraction from "the issues residents of the 10th District are concerned about." "Virginians are concerned about the future not decades old political grudges," said Johanna Persing, a campaign spokeswoman. "Virginians know that Barbara Comstock has a proven legislative record of helping to grow the economy and creating jobs and those are her priorities when she is elected to Congress." The ad is paired with a simple website, StandingWithHillary.com. On the website, visitors are asked to register with their email and postal code. Comstock has not been shy in her desire to continue to investigate the Clintons. She told delegates at the Virginia state Republican convention that if elected, she would try to get to the bottom the September 11, 2012 terror attack on a U.S. compound in Benghazi, Libya that killed four Americans. The attack, which occurred while Clinton was secretary of state, has continued to dog her since she left the office in 2013. Clinton has been more open about her presidential aspirations of late. 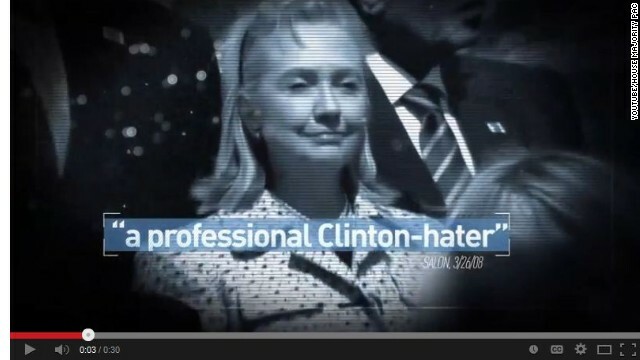 Widely seen the frontrunner for the Democratic presidential nomination in 2016, the former first lady is already getting hit in campaign ads from the right. Comstock will face off against John Foust, the Democratic nominee for the seat, in November. Both are vying to replace the retiring Rep. Frank Wolf. "Continues to dog her", OK, whatever you say, its more like Republicans continue to waste your tax dollars, and avoid doing anything that remotely resembles real work, and continue to ignore the lack of any evidence of wrong doing, and insist she will expose the CIA operations that were /are still going on. But my question is about her credentials, you know, the important stuff, like can she castrate a pig, ride a motorcycle, shoot guns? I simply couldn't imagine being so naive, or spiteful, and I doubt I'll ever be rich enough to vote for any Republican, ever. Can't wait to see Republican AND Democrat Obama-hatin' ads to start coming out! Its monday. Time for the daily feather fluffing of Hillary. But no matter what. Feathers are still dirty..
"Serial Clinton hater"? is it possible that the we need to "demilitarize" our politics? It's come off the rails, folks. Hillary is a lousy candidate.........anyone who lived through the Clinton years, in Bill's presidency, which was really nothing but a series of scandals, should already know that. They should also know that Hillary was a major player in some of those scandals. -can't see Nov here, to drive all these rethuglicans home and fix hospital hackers done by these GOP I suspect. Drive all rethuglicans home, all say Hillary16. H Clinton like most dems are just backwards on things and time will prove this ? It must be sad to be four fries short of having a full happy meal . Lovely. She was part of that $80 million waste of tax money used to investigate Clinton during impeachment. If only they'd seen fit to probe the crooks who got away with billions, brought our economy to its knees in 2008. Instead, they're still in Congress or on the outside telling the crooked members of Congress how to vote. It is frightening to think the ones who crashed our economy, still have much control over it, and are being paid to "fix"it, lord help us. Back to Arkansas, you covered up white water, travel gate, health care 101, Libya, and for your cheating husband. And for giving into the pressure of 2008 to let BHO win your nomination for president. You don't deserve a second chance. Hang it up. Be a grandmother and help heal your marriage. That is the important job we cannot afford you mess up. I dunno, Rick. It was under the Clintons we had our last remotely good economy for the Middle Class. As to the "scandals", we got exposed to the GOP's now fully bloomed insanity of "say anything" idiocy of fake controversies, or more politely, "controversies without facts". I think the biggest scandal was the GOP impeaching Clinton, all the while Newt Gingrich was having an affair-and lying about it. The GOP is a very sick, moral-less body, that has no interest in leadership. Just division and hatred. I think the biggest scandal was the GOP impeaching Clinton, all the while Newt Gingrich was having an affair-and lying about it. What does Newt Gingrich have to do with lying under oath? Heck, the far left controlling faction of the Democrat Party, the Progressive/Communist wing, even hates Hillary Clinton. Where the ad attacking them? Why do you think they want their far left whack job Warren to run? CNN must be convinced that Hillary is such a lame candidate that she constantly needs to have puff pieces written about her to bolster her supposed candidacy. It is really sad when you think about it. Certainly, TOM I, even you the hyper partisan you are can see the utter hypocrisy of putting a sitting President of the United States on trial for lying about an affair, lead by a Speaker of the House of Representatives who himself was lying about an affair.... or am I wrong about you? I think Clinton was protecting his wife's reputation under the circumstances. I think any husband would have denied cheating on his wife in that scenario. Bill put his job on the line to protect her reputation. Bravo, for Bill. What difference does it make about what was the subject of his lying? He lied UNDER OATH, which is perjury, and most certainly falls under the realm of high crimes and misdemeanors to file articles of impeachment. "What difference does it make about what was the subject of his lying? He lied UNDER OATH, which is perjury, and most certainly falls under the realm of high crimes and misdemeanors to file articles of impeachment." LOL. Bill did what any good husband would have done to protect his wife from public humiliation. He denied it. He risked his job and everything. And, it drives the right wing absolutely bug nuts that Hillary loved him to tears for doing it.